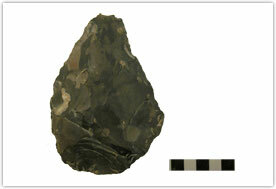 The lithic analysis of all the artifacts excavated during seven field seasons at GBY has been completed. The database (first generated in 1989 and continuously updated since) is currently being thoroughly examined in order to generate results and the associated statistics by various analyses. 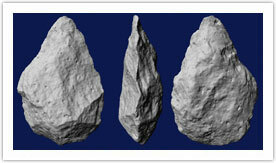 Bifacial tools (handaxes and cleavers), the hallmark of the Acheulian techno-complex, occur in all of the GBY assemblages. A detailed morpho-technological analysis of these tools has recently been completed and the assemblage was found to comprise 780 items: 570 handaxes and 201 cleavers. 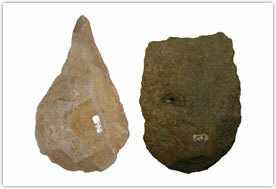 The study of the GBY bifacial tools focused on two aspects: a) The chaîne opératoire, i.e. the reduction sequence from raw material acquisition to the shaping of the tool, or the sum of all the activities that culminated in the pre-planned final object; b) the contribution of the morpho-technological study of bifaces to the understanding of human behavior and material culture. Flint handaxes from Layer II-6 Level 1. Basalt cleavers from Area C.
Some of the giant basalt cores. Raw material exploitation mode: The great majority of the GBY bifaces were produced on basalt. 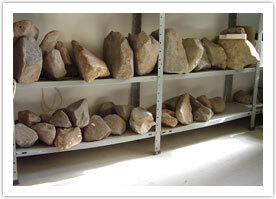 Only a single cleaver and 39 handaxes were produced on flint, while limestone was even more rarely used. 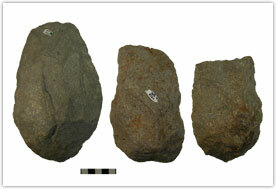 The presence of cleavers: GBY is the only site where cleavers form a significant component of the bifacial tools. Large flake technology: The bifacial tools at GBY are shaped on large flakes (> 10cm) that were detached from giant cores. 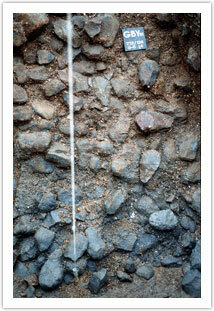 The use of this particular technology illustrates the African affinities of the site. Section of Layer II-6 Level 4 showing wealth of basalt handaxes, cleavers and large flakes. The density of the GBY bifacial tools: Some of the excavated Acheulian horizons display a density of more than 10 bifacial tools per m2. Such a density is otherwise known only from African Acheulian sites, and thus the GBY bifaces at present remain the sole example in the Levant. Technological abilities: Extensive planning and foresight were coupled with a thorough knowledge of the environment. Furthermore, it can be demonstrated that the planning resulted in systematic production of the bifaces. This is evident from the high degree of standardization that characterizes the entire biface assemblage of the site. The study of the bifacial tools of GBY has shown that the site is unique among Levantine Acheulian sites in choice of raw material, technology, typology and morphology. Furthermore, the analysis resulted in the identification of clear African affinities. Hence, the Acheulian material culture of GBY is viewed as an indication for a distinct migration wave of early/middle Pleistocene hominins “Out of Africa”. A study of a particular morphotype (massive scrapers): This study relates to a complex hominin behavior and concludes that Acheulian planning ability and depth were similar to those of modern humans (Goren-Inbar et al., 2008). 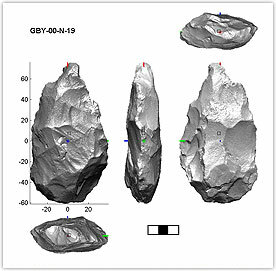 Generation of 3D digitized scanned archive of bifaces (N=400): A 3D optical scanner was used to provide a digitized in order to obtain precise and complete representations of all of the GBY bifacial tools. A computer algorithm, specially developed for the purpose, was used to position the artifacts in a way that enables the extraction of the standard metric parameters (length, maximal width, width at 1/2 length, etc.) (Grosman et al., 2008). This new methodology creates accurate and objective databases. Several other parameters (center of mass position, volume) were also computed. Experimental barrel used for simulating environments of high-energy accumulation. The application of 3D imaging: 3D imaging was used to understand the impact of a high-energy depositional environment on bifacial tools, their preservation and morphology. In this experiment handaxes produced by a modern knapper are subjected to tumbling with pebbles and basalt cobbles in a specially designed rotating barrel, simulating a fluvial environment. Preliminary results show that the tools are very sensitive to damage and lose 1% of their total volume after only five rounds in the barrel. The contribution of 3D imaging to the identification of morpho-typological handaxe groups – a case study from Nahal Zihor (Negev): This study focuses on the application of the 3D scanning technology to two handaxe assemblages in order to examine the extent of their inter-assemblage variability and to develop a methodology that could produce typological criteria for distinguishing between groups. This distinction may reflect different time units and/or techno-cultural origins. Goren-Inbar, N., G. Sharon, N. Alperson-Afil, and I. Laschiver. 2008. The Acheulian Massive Scrapers of Gesher Benot Ya'aqov - an Associated Product of the Large Cutting Tools Chaîne Opératoire. Journal of Human Evolution 55:702-712. Grosman, L., O. Smikt, and U. Smilansky. 2008. On the application of 3-D scanning technology for the documentation and typology of lithic artifacts. Journal of Archaeological Science 35:3101–3110. Goren-Inbar, N., L.Grosman, and G. Sharon. 2011. 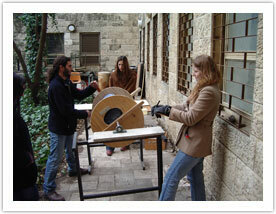 The technology and significance of the Acheulian giant cores of Gesher Benot Ya'aqov, Israel. Journal of Archaeological Science 38:1901-1917.